Our first full day of birding and we're up at dawn to...make breakfast. The night before we'd made a quick stop at the grocery store so we could save a little money on the trip by preparing our own food. The idea was we could pack lunches. I'm a big proponent of this approach as I get hangry when I don't eat. Hangry is Hungry+Angry. I also happen to get mind splitting migraines which make it awfully hard to see birds when you feel like you're going to throw up. I've been out birding before where the nearest town is miles away and the best option you can find is questionable canned goods at a general store. While birding in North Dakota a few years back I remember friends scrambling for lunch at a tiny general store in the middle of nowhere. I think my lunch was a Dr Pepper and a box of cookies. My buddy Mark had a cold can of franks and beans. This was precicely the sort of situation I wanted to avoid. As it turned out, we were within reach of decent lunch food at all times but you'll have to wait a little longer to hear the story of the firey demonic end of the week apparition at the gas station lunch stop. We're only on Monday after all. We wake up in the morning and while waiting for breakfast, Tony and I check out the bird situation outside. We have time to wait because, for some bizarre reason, we've chosen the worst possible breakfast foods to prepare when we should be up early birding. It turns out, though no fault of his own but rather to a quirk of evolutionary biology, Curt is allergic to milk so something quick like cereal is off the table. There are other very fast options. I'm a piece of toast for breakfast kind of guy but we decided to make eggs, lots and lots of eggs. While they were nutritious and gave us lots of energy for the day they were not quick. Photo of Tony and me in the front yard. Yeah, it wasn't actually taken on Monday morning since Erik wasn't awake yet on Monday but let's be honest, if I hadn't mentioned it you'd never have known this was actually a different morning right? Photo by Erik Brunkhe. While Curt was inside cooking up milkless scrambled eggs, Tony and I headed outside to look for birds from our host Clair's front yard. As the sun lightened the skies, we spotted Black Vultures, Red-tailed Hawks, Crested Caracara, an American Kestrel, Eastern Phoebe, Great Kiskadee and an amazing dawn flight of what must have been tens of thousands of passerines heading into Mexico. There was a river of birds from horizon to horizon. We could make out the calls of red-winged blackbirds but we could also see birds of all sizes in the mixed flock. By the time Curt and Erik got outside they were all gone. We thought we might see such a display every morning but no luck. We finally packed the car and our first real day of birding started off with U-turns. We relied on our phones to navigate and, in a pattern that repeated itself with startling regularity, the directions weren't quite right. We were looking for Frontera Audubon in Weslaco. It is easy to miss and we had to turn around a few times. We finally fount it but immediately it didn't look quite right. It looked like we'd puled into someone's driveway and there was no one around. We're here to see the Golden-crowned Warbler. At this point in my birding career I've seen pretty much all of the warblers to be seen in Minnesota except for one. The chance to see new warblers is exciting and Golden-crowned would be fantastic. They are essentially a Mexican species that sometimes shows up in the very southern most parts of the US. This is exactly the sort of bird people come to the Rio Grande Valley to see. The golden-crowned is a handsome warbler with an olive or greenish gray back and bright yellow belly and undertail coverts. The head striping is reminiscent of a sparrow. The head is gray with a yellow crown stripe boarded by bold black. The supercilium can be yellow or white depending on the sub-species and the head striping is capped off by a black eyestripe. This is all theoretical of course. I don't have any photos to show of the Golden-crowned warbler because Frontera Audubon was closed. It isn't unusual to find a birding location closed in the early morning but, of course, this wasn't early owing to our eggstravaganza. By the time we finished breakfast and drove to Weslaco the sun was well up. In what we hoped wasn't an omen of things to come, a small sign told us that Frontera Audubon was closed on Mondays. Fortunately for us, rumor was that they would be open for some special hours later in the day. Time for plan B. We headed to Estero. We rolled into Estero Llano Grande State Park eager to finally do some birding. I hadn't done my homework so I wasn't sure what to expect. It looked like a trailer park to me. The simple explanation is that it WAS a trailer park. We ran into a park employee who told us about how the trailer park used to be run by a botanist so the plant diversity was off the chart. The trailer park was eventually bought up by the state park and people are slowly moving out though attrition. There were only a few residents left. This was our first exposure to a pattern we would see later. People live in a spot rich in bird life. The state or other agency moves in and buys the land to protect the birding hotspot. The people move out and the birds go away. It would seem that the birds were not there in spite of the people, they were there because of the people. The residents of the trailer park nearly all had feeding stations where they would put out seeds and fruit. This naturally attracted a lot of birds. This isn't to say there aren't a lot of birds there now, but from what I can gather it used to be even better before the area was taken over as a state park. One of the first things we noticed were the butterflies, in fact, there were tour groups of butterfly enthusiasts there. They were beautiful and we saw more butterflies than I have ever seen in my life. Here's one of my favorites, the Mexican Blue Striped. The photo isn't upside down, this species of butterfly seem to prefer to hang out that way. The employee we ran into chatted about butterflies and birds with us and then asked us, if it wasn't too much trouble, to please pay the park entrance fee, "You know, when you get a chance." This was an interesting change from how things work in Minnesota. Back home the entrance to every state park goes past a ranger station and you pay by the car to enter. It seems here you are free to wander in and then if you get around to making it to the visitor's center and you happen to pay they would be every so appreciative. There were signs up in the bathrooms reminding people that the money they pay really does help the park. It made me wonder if there has been a tradition of not paying and they are trying to ease people into the idea that they should pay. Not paying isn't even an option back home. While at Estero we got all kinds of good birds. The park employee decided to walk us down to the end of the road in the trailer park section of the park to show us a roosting Common Pauraque. Fantastic! Common Pauraque blending perfectly into the ground litter. Always talk to the employees. We staked out a feeding station and waited for the birds to come. There were golden-fronted woodpeckers everywhere. They were thick in numbers like chickadees are back home. I also saw Black-crested titmice and white-tipped doves. Other than that, it was a bit quiet. We watched a puddle where olive sparrows sometimes hang out but there was nothing there either. I was beginning to question how fabulous Estero was as a park but I still hadn't seen the main part of the park. We'd started in the trailer park and the main older section was still to come. While sitting on a park bench at the feeding station I could hear an incredible cacaphony of noise though the brush. It sounded like thousands of birds. "Why are we staking out this feeder with no birds at it when I can hear thousands of birds over there?" I was thinking. We headed over to the main older part of the park next and finally I was seeing some incredible numbers of birds. Erik scoping the main pond at Estero. The visitor center is perched right on the edge of a fantastic pond filled with bird life. There were Black-belied whistling-ducks, a pair of Fulvous Whistling-ducks, Gadwall, Ruddy Ducks, Mottled Ducks, Least Grebe, Great Kiskadee, Blue and Green Winged teal, Northern Shoveler, Northern Pintail, Redhead, and Pied-billed grebe. We looked closer and saw Anhinga, Great Egret, Snowy Egret, Tri-colored Heron, and Great Blue Herons. Scanning the skies also turned up Turkey Vultures, Coopers Hawk, Red-tailed Hawk, Merlin, Peregrine Falcon, Crested Caracara, and American Kestrel. We scanned closer and and closer, moving our scopes back and forth across the pond and found Sora, Common Gallinule, American Coot, and Killdeer. A lone Northern Pintail hanging out with the other birds. Patience and a good scope pay off. Hiking around the park we add Solitary Sandpipers, Least Sandpipers, Rock Pigeons, White-winged doves, Eurasian Collard-doves, Mouring Doves, Inca Doves, Ruby-throated Hummingbirds, Buff-breasted Hummingbirds, Belted Kingfisher, Blue-headed Vireo, House Wren, Blue-gray Gnatcatchers, Ruby-crowned kinglet, Long-billed Thrasher, Northern Mockingbird, Black and White Warbler, Tennessee Warbler, Orange-crowned Warbler, Common Yellowthroat, Wilson's Warbler, Northern Cardinal, Red-winged Blackbird, Bronzed Cowbird, Brown-headed Cowbird, and House Sparrow. On a tip from one of the employees we headed back to a section of trail at the far end of the property where there was an old abandoned woodduck box. Roosting in the hole was an Eastern Screech Owl. We were excited to see it as it was different from the Eastern Screech Owls we have at home. This was the McCalls subspecies, Megascops asio mccallii. They are only found in south-central Texas and Northern Mexico. There is some talk of splitting this bird off into a separate species at some point. Screech owl taxonomy has been contentious for nearly 200 years but DNA analysis is starting to clear things up. The McCalls or Texas Screech Owl is always gray, never rufous, and does not do the familiar whinny call of other screech owls. I've seen screech owls back home but if they every split these out I'll pick up what they call an armchair lifer. We stayed at Estero for five hours and saw 61 species of birds. That's a new bird species every four minutes. Fourteen of them were lifers. Alligator Pond does indeed have alligators. As we're wrapping up at Estero we ran into some birders we know and the information swapping and planning begins. The original plan had been to go ofter the golden-crowned but we abandoned that in favor of a Painted Redstart. We're thinking we can go back for the golden-crowned later. It was at Frontera last year as well. We figure it isn't going anywhere. Turns out it we were right for the wrong reason. It didn't matter that we didn't try to see it on Monday but not because it would be easy. No one saw the golden-crowned warbler the entire week. We were excited about the prospect of a Painted Redstart. While they can be seen in New Mexico and Arizona, they are not very common in Texas and it was a bird we all wanted to see. It would be a lifer for me. Now in theory the Painted Redstart didn't seem that hard to find. We had directions to where the bird was and people had seen it that very day. 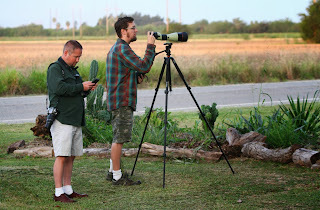 In fact, when we left Estero, members of the Leica optics crew were looking at the bird and we had them on the phone. This was going to be easy. Dear readers, now would be a good time to refer back to the to tenets of birding mentioned in the post for Day One. Tenet 1: Directions to a site/bird will always be terrible. We spent the rest of the day on a wild goose chase. People continually gave us terrible directions such as, "Park in the parking lot and look in the courtyard on campus. The bird is there." Well, there are about 20 huge parking lots and the college campus we were visiting was huge. There were tree-lined open spaces everywhere. We tried again and again and finally figured out after calling multiple contacts that the bird had been seen behind the science building. This would have been helpful information to get from the start. After much fruitless searching. we dipped on the Painted Redstart. Dipping is one of those birder things. It means we missed the bird. We got a consolation prize though, a Clay-colored Thrush. This was a lifer for me. The bird used to be called a clay-colored robin but there's recently been a change in the common name. A true Robin is a european bird completely unrelated to the American Robin. American Robins are actually poorly named thrushes. To avoid confusion, the word robin is finally being phased out for all members of the thrush family with the exception of the American Robin. Why not the American robin? Because the non-birding public would likely go absolutely insane if we tried to change that. People get all up in arms when you tell them that "Canadian Goose" is not the correct name for those birds in the park. Imagine if we started to tell people those birds eating worms in their yard are actually American Thrushes. We sated ourselves with the half-way decent sighting of the thrush high in the tree. At least the wild goose chase hadn't been a total waste right? Of course, I was forced to re-evaluate that days later when a clay-colored thrush was nicely sitting on the ground at a feeding station in perfect light just 8 feet away.